Christmas Eve is in the air. Sweetheart and I are enjoying a quiet Christmas Day together. Our children are spending time with their children at home. Since Thanksgiving Day I have been with each child and granddaughters on a one on one basis. Early in November I visited our son in L A. Our middle son and family spent Thanksgiving Day with us, and our sweet daughter graces us with her presence at least twice a week. LOL. In fact, I went to the movies with her and girls tonight. 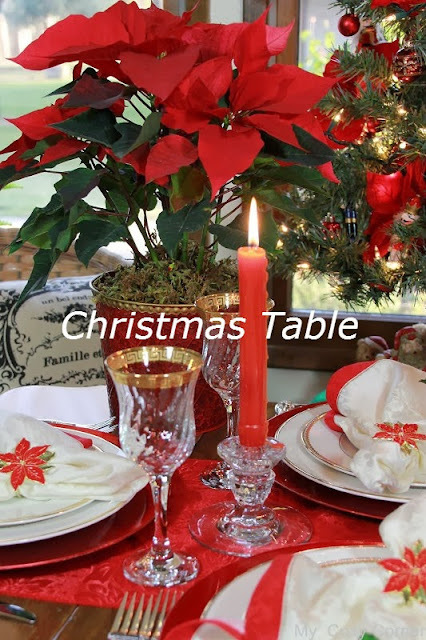 I set a small table by the dining room Christmas tree for a more intimate feeling. I just think Christmas wouldn't be Christmas without a Poinsettia plant. And when I found the Lenox Poinsettia napkin rings on clearance last year and then I found the Lenox Poinsettia napkins. I knew I was in heaven. A dish lover's dream come true! The candle light is so amazingly beautiful. The table is all decked out with red chargers and Ralph Lauren dinner plate and salad plate. The crystal candle stick holders I've had for 24 years. I have a red runner on the table, and my frenchy pillows in the chairs. My silver flatware is 'Affection' So true for the two of us. I love the red and cream color combination for Christmas. The poinsettia napkin rings are the perfect bling for this beautiful table. Merry Christmas! Gorgeous...love those napkin rings (and everything else)! How beautiful, Betty! Such a festive table, and those napkins are so pretty! Thanks for linking to Let's Dish, and have a very blessed Christmas! Everything is just beautiful! I love those poinsettia napkin rings! I hope you had a wonderful Christmas!